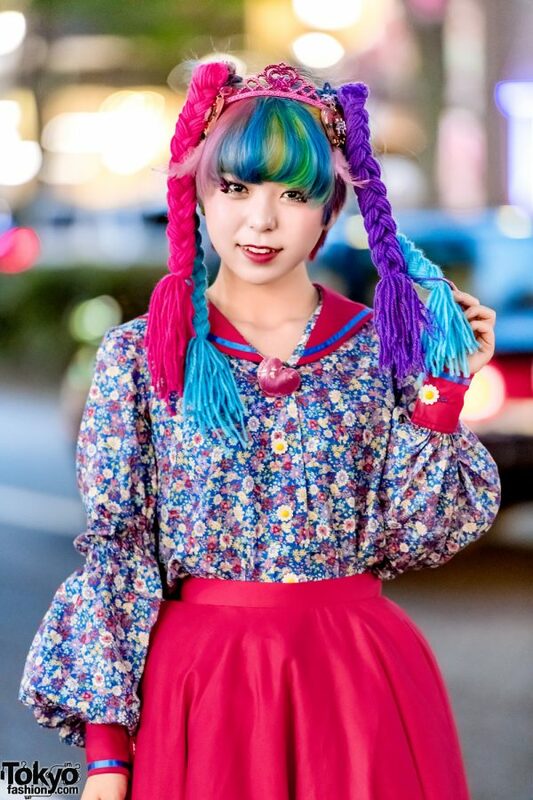 We met Lisa, an 18-year-old student whose colorful yarn hair falls and doll-like inspired fashion definitely made her a striking attraction on the Harajuku street. 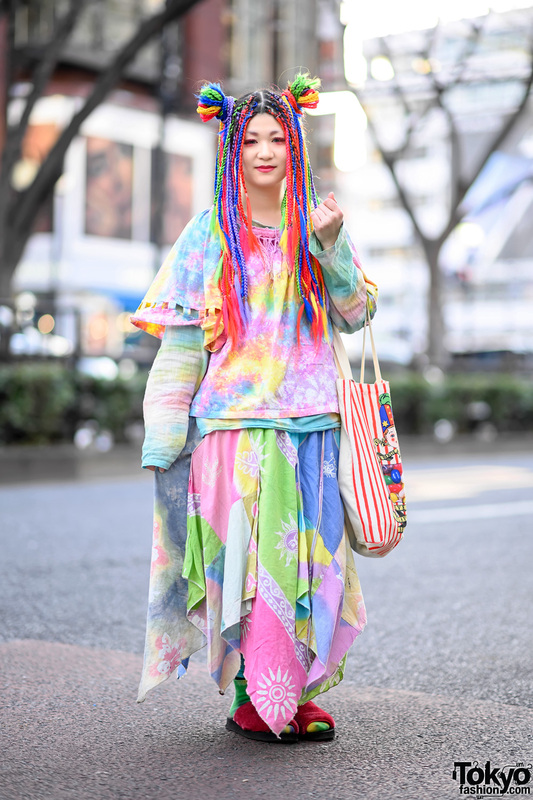 She is often featured in our street snaps because of her creative street stylings. Sporting a DIY ensemble, Lisa is wearing a floral print long sleeve blouse, with contrast pink-and-blue cuffs, sunflower buttons, a sailor collar and lace-up back detail. She tucked her blouse into a pink full pleated midi skirt with an A-line silhouette and belt loop detailing near the hem, and slipped into black platform sandals, which she bought in Harajuku. She finished off her look with pink, purple and blue braided yarn hair falls attached to her short unicorn hair, a pink princess glitter crown with feathers, glitter eye makeup, and a pink heart pendant necklace. 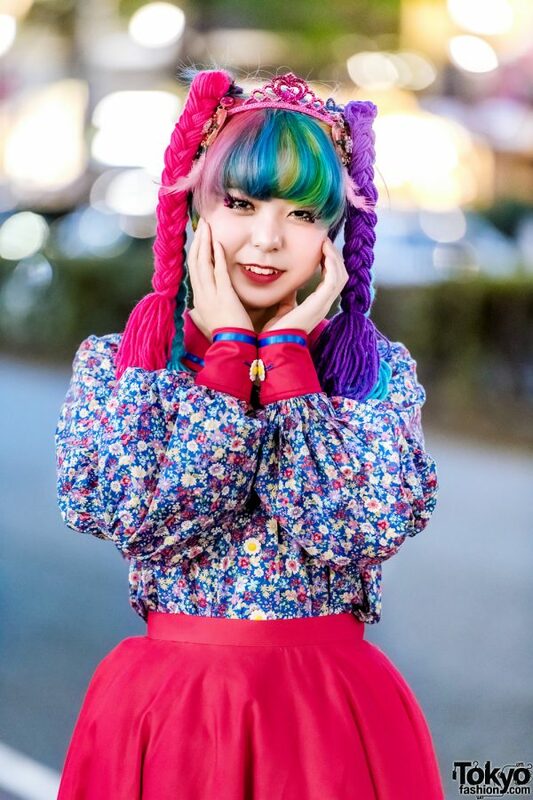 Lisa loves the music of One OK Rock, and she is active on both Twitter and Instagram.